An essential safety feature in offices, shops and schools, factories and all public premises properly serviced fire extinguishers will keep your people and premises safe. 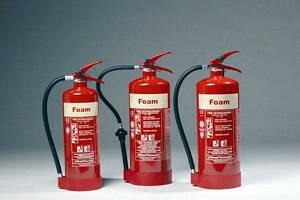 Keep them primed and ready for action with a regular service visit from ETC Fire's trained BAFE qualified Inspectors. If you are located in Burgess Hill ETC Fire are here to keep your fire extinguishers serviced and ready for action. Scheduling visits at regular intervals will ensure you keep up to date with fire safety and make the difference between a small fire causing minimal damage to your property or a full scale disaster that creates havoc for your business and risks death or injury and damage to your premises. So you cannot afford to do without fire extinguishers, and keep them serviced appropriately which is a legal requirement. You won't have to worry about fire extinguisher servicing ever again with a contract from ETC Fire. Call us to arrange service visits at regular intervals and you can rely on us to carry out inspections and advise on your fire safety precautions. CALL US NOW to book your service visit in Burgess Hill. Small portable fire extinguishers are easily obtained from ETC Fire and stored in the right place are a reassuring sight for staff and visitors. Don't let a small fire become a major disaster. ETC Fire are a BAFE Approved Company in Burgess Hill offering servicing for your fire extinguishers as well as a full range of fire services, including training and accessories. We sell fire extinguishers for any situation and can survey, quote, install and maintain a servicing contract for any kind of fire extinguisher in any kind of building whether factory, shop, school, care home, wherever there is a need for fire extinguishers in Burgess Hill, you'll find our services very helpful. As well as our trained engineer fire extinguisher servicing Burgess Hill clients can benefit from our accessories ordering service and book training for staff by contacting us here. A service visit regularly from a qualified engineer will ensure that you keep in line with health and safety legislation and ensure the safety of your staff and visitors to your property.